Whenever I think about wine in Israel, I think more and more about wines from the Judean Hills of Israel, one of the five wine regions of Israel that wraps Jerusalem and the surrounding areas. 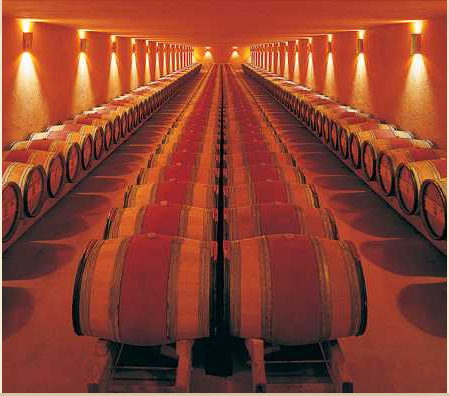 The most famous winery in this region is also the original winery in the region, the Domaine du Castel. The winery is situated in Ramat Raziel, at the top of hill overlooking the moshav, which lies some 17 or so kilometers from Jerusalem. The story of the winery is one of love, determination, and above all else; family. It takes a fair amount of courage to drop one’s status quo and go after one’s dreams. That is exactly what Eli Ben Zaken did some 19 years ago, when he started the winery, and gave over the day-to-day management of, his then day job, the family restaurant, to his son, Eytan Ben Zaken. 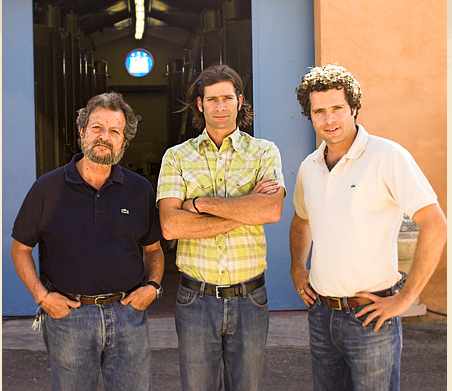 The very same son, who now runs the day-to-day operations of the winery, as its COO, along with his brother Eli Ben Zaken, who is the winery’s CEO. 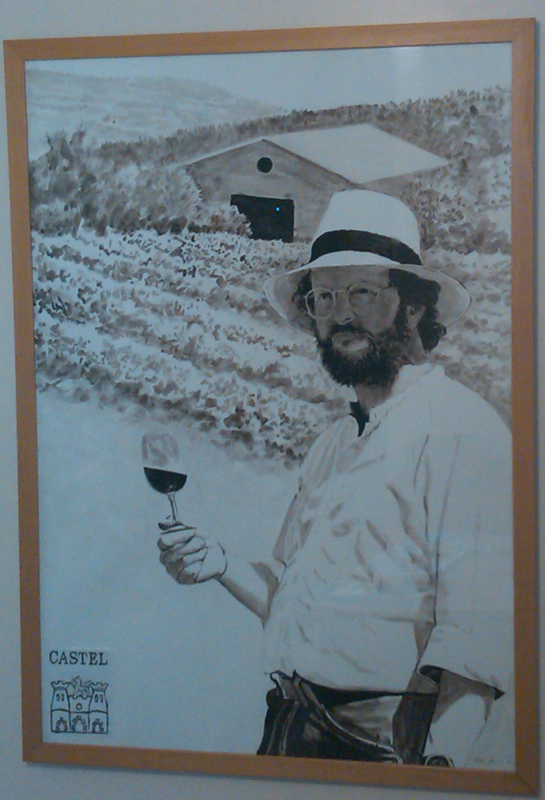 However, we need to go back in time to get a real appreciation for the story of Mr. Ben Zaken and the Domaine Du Castel. The story starts early in the life of Mr. Zaken, he was born in Alexandria Egypt to a Moroccan Father and Italian mother, and then moved about Europe between England, Switzerland, and Italy. It was in his movements around Europe that he gained a love for agriculture, culinary culture, and wine. Like many Jews Ben Zaken felt the pull to move to Israel, and he made it a reality after the Six Day War of 1967. Soon upon arrival he got to work in what he knew well – agriculture. After some time he built a house in Ramat Raziel and followed his initial love and roots in 1980, when he opened the first real Italian Restaurant in Jerusalem; Mama Mia. Upon opening the winery he went out looking for some locally made wine to serve to his customers and he did not really love what he found. Since then Domaine du Castel has been pulling in some of the highest scores and praises from the world’s experts, France’s prestigious Bettane & Desseauve guide counts the winery as one of the 365 worlds best vintages. Daniel Rogov recently commented “Since its inception, Castel has been one of the very best wineries in the country..”, and Mark Squires of The Wine Advocate consistently gives their wines a 90 or higher. Not only is the winery doing extremely well but so is the wine region. 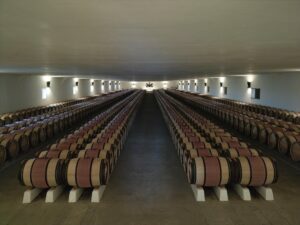 The very same wine region that Baron de Rothschild reportedly thought was not conducive to making great wine, was the same region that originally grew the grapes for the Temple, some 2000 or more years ago. It is also the very same region that now makes some of the very best wines in Israel, with some of the biggest names in Israeli wine business sourcing their grapes from the Judean Hills. 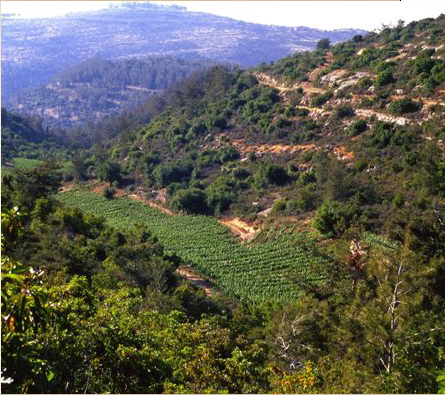 On top of all that Mr. Ben Zaken original vineyard was the first of its kind in the region for some 2000 years! It takes a visionary to see the potential in a land that others ignored, to put down roots in a rocky soil without any training to lean on. Maybe more than all that it takes true courage to walk away from a successful and burgeoning restaurant to start a venture you know little about! Still the wines he produces have been garnering praise from their incubation and have never looked back. It was not until the 2003 vintage the wines were kosher, but that does not detract from their quality in any way. The styling of Ben Zaken’s wines is very much in line with the great wines of Bordeaux and Burgundy. His two red wines; the Petite Castel and Grand Vin are both reminiscent of fine Bordeaux wines, where the oak does not dominate. These are wines that are more old world rather than new world. The Petite Castel is a blend of mainly Cabernet Sauvignon and the rest, in order of importance is Merlot, Petite Verdot, Cabernet Franc and Malbec. The wine is aged for 16 months in French oak barrels. The Grand Vin is Cabernet Sauvignon and the rest, in order of importance is Merlot, Petit Verdot, Cabernet Franc and Malbec. 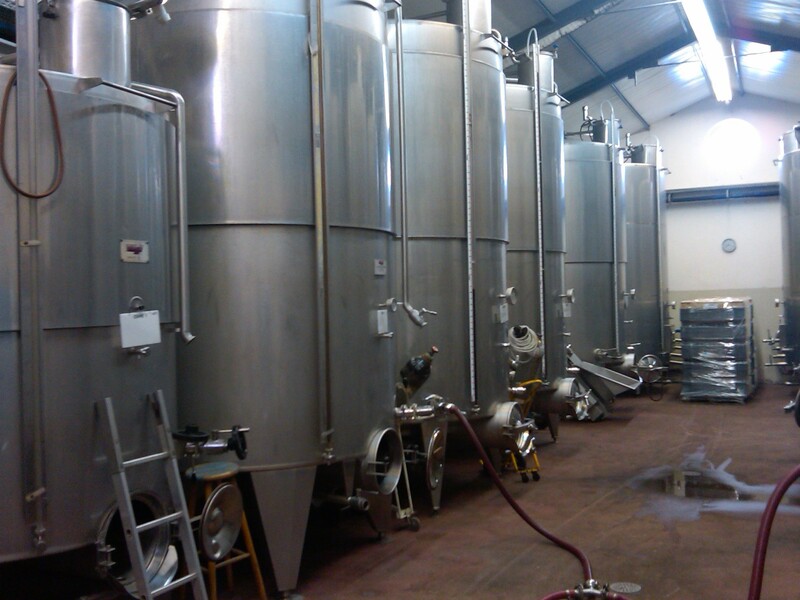 The wine is aged in 100% new French oak for 20 to 24 months. The Castel ‘C’ Chardonnay is equally Burgundian in style, though I think recent vintages have been pouring on the oak, more new world in style, but the fruit and acid are very clear, so maybe it is a hybrid between the old and new world wine. In 2009 Domaine du Castel added a fourth wine to its portfolio; a Rose, made entirely of Merlot grapes and produced using the saignée method (i.e., making a wine from red grapes and allowing the free-run juice to run off with minimal skin contact). 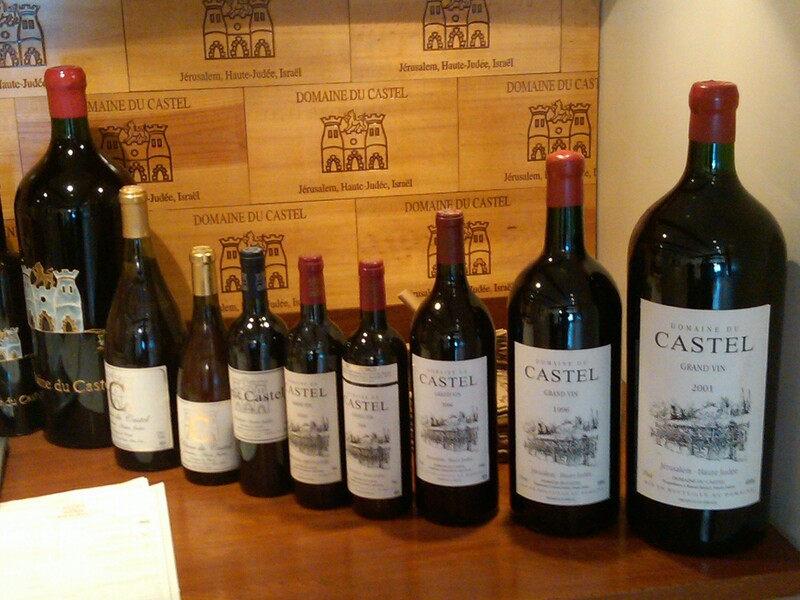 The super cool aspect of the Domaine du Castel is that they have been around for 19 years! Sure, there are a few other Israeli wineries with that kind of longevity, Carmel, Yarden, Tishbi, etc. Still, they are the oldest winery in the Judean Hills and that is what separates them from the rest of the pack. Besides distinguishing itself by age, the winery has climbed the wall of worry by receiving the largest number of accolades from outside of Israel. Israel wines have been slow to receive the awards that they truly deserve, but Domaine du Castel is doing its part to reverse that course, and to bring the spotlight down on the country’s wines. While the wines follow the French Old World style the vines and terroir have little in common with its French counterpart. France’s issues are nowhere to be found in the Mediterranean styled terroir of Israel. The hot and dry summer days are capped with Mediterranean breeze as the day progresses to allow the vines and grapes to cool and slowly progress to its ultimate end goal of ripeness at the end of the summer. France has the cooler days brought by the summer rains that often do not allow the grapes to reach their ultimate goal of full ripeness by the end of summer. 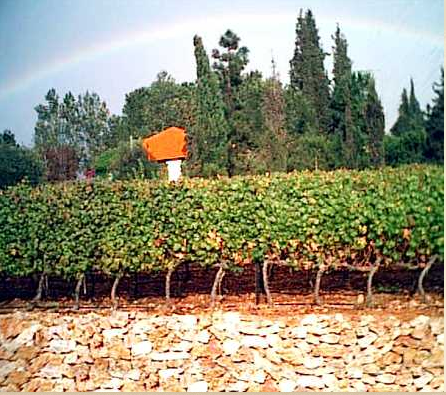 Israel of course has rain, but only in the spring and winter months, thereby giving wineries the ultimate control to only irrigate the vines when needed. Since the beginning Mr. Ben Zaken wanted his kids to be part of the family business! 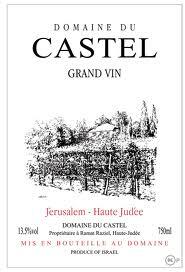 As stated on the web site: It is not by chance that all my family is involved with Domaine du Castel. Without the initial interests shown by my sons Ariel, Eytan, and my son-in-law Arnon, I would not have invested time and energy into starting a new venture whose successes will only be truly enjoyed by the future generations. After Mr. Ben Zaken started the winery, he handed the Mama Mia restaurant over to Eytan Ben Zaken and then when the restaurant closed down, he transitioned over to being the winery’s COO. Ariel Ben Zaken recently took over as the winery’s CEO, after a stint in France with Michel Picard at Domaine Emile Voarick and studying winemaking in Beaune. Ilana Ben-Zaken, Mr. Ben Zaken’s daughter works as the winery’s export manager. As you approach the building there are a few things that immediately grab your eye. 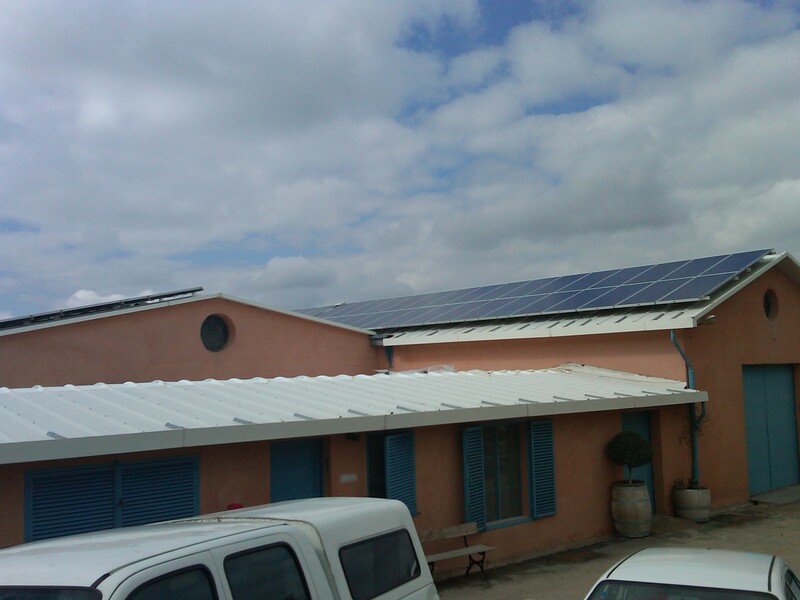 The first is the pair of massive solar arrays that grace the two buildings low pitched roofs. We did not get a chance to see how many actual panels they have in the arrays, but there were at least 50 or so panels, if not more. Once you get past the initial shock of how green the winery is turning, the second thing that catches your eye are the pair of round windows that grace the front of the building’s gables. 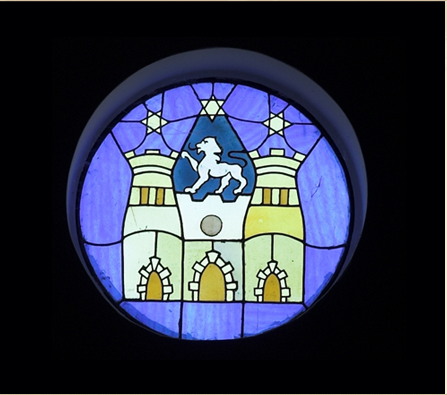 Each window is sumptuously adorned with the winery’s emblem; has three stars overlooking a castle, with a lion perched on top between its two turrets. This very emblem adorns every wine bottle that the winery produces, in one way or the other from the early 2000s. Prior to that, the image of Mr. Ben Zaken’s old vineyard and home graced the winery’s bottles. The three stars represent Mr. Ben Zaken’s children; Eytan Ben Zaken, Ariel Ben Zaken, Ilana Ben-Zaken. The Castle represents the crusader fortress (Castel), which was uncovered under an abandoned Arab village in the vicinity. The lion represents the emblem of the Judea tribe, upon whose Biblical assigned land, the winery is built upon. So there you go, that is the background of the Domaine du Castel, and with that backdrop, we found ourselves waiting outside the winery for the ever effervescent and striking Ruth Amir, who we have had the pleasure to meet a few times, over the years. Being that my friends had not visited the winery before, Ruth was very kind to walk us around. 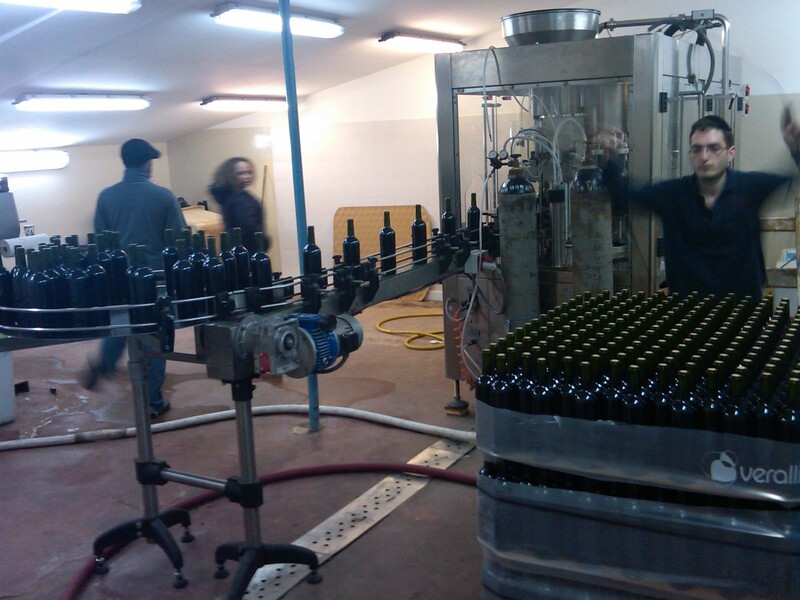 It happened to be that while we were visiting, the winery was in the middle of bottling the 2009 Petite Castel. 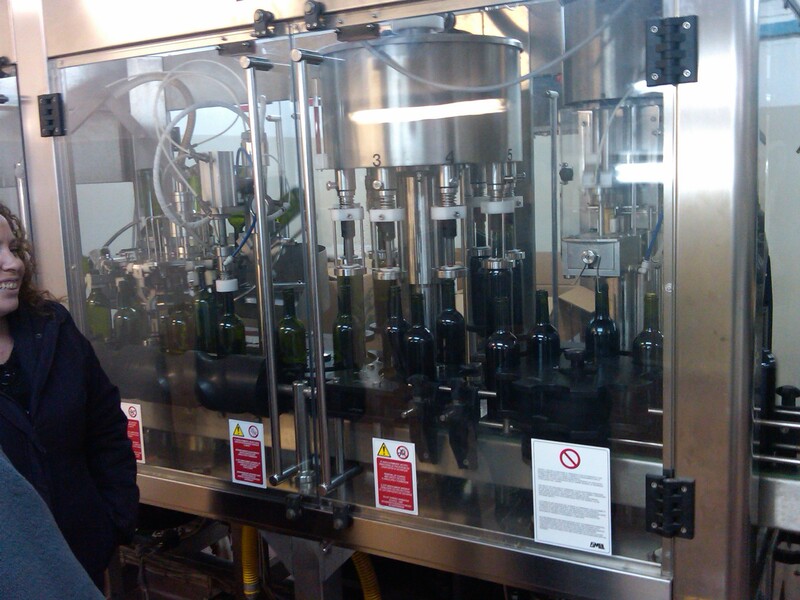 It was very cool to get to see the bottling machine and line in action, with the pump and the long hoses exuding from the massive tanks, it was almost like we were crashing on an otherwise intimate affair. Ruth then glided us through the vat room and then down to cellar and past the library wines (older wines that have been put into hiding by a winery for later use), through the white wine barrel room, and then on to the STUNNING red wine barrel room, which is reminiscent of the barrel room of Chateau Mouton Rothschild Pauillac. Upon completion of our tour we sat down to a tasting of some wonderful wines. The first wine; the 2009 Domain du Castel ‘C’ Chardonnay, is one that is shrouded in a cloud of controversy regarding its current state of drink-ability. We all found it quite lovely, but many who have tasted it recently, have found it reductive and undrinkable and not recommendable, but some think it may come out of this funk. When we tasted the wine, it had no smell of cabbage or rubber, but did have a fair amount of burnt or toasty oak, but that is common to many of the C vintages, and was no different between this bottle and other vintages, as stated above. While I was fully concentrated on the wines, my friends were all over the cheese and crackers that Ruth was so kind to serve and place in the center of the table. 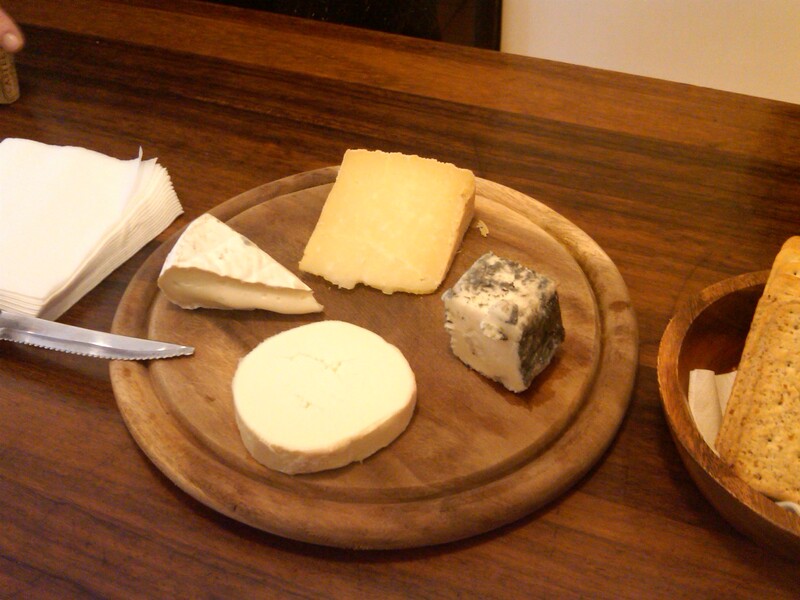 The goat cheeses were supplied by the famous Barkanit Cheese, and they looked and smelled fantastic! The next wine was the 2008 versions of both the Petit Castel and Grand Vin. The Petit Castel wine is always a blend of Cabernet Sauvignon, Merlot and Petit Verdot, which is then aged in French oak for 16 months, a Bordeaux-styled wine that could come only from the Mediterranean sunshine. The Grand Vin is a moving target, for its blend components, but the 2008 was a blend of, Cabernet Sauvignon, Merlot, Petit Verdot, Cabernet Franc and Malbec (60%, 20%, 10%, 6% and 4% respectively). I did not taste either, as they are shmitta wines, and as I described in my Kosher 101 post, I only drink Otzar Beit Din Shmitta wines. 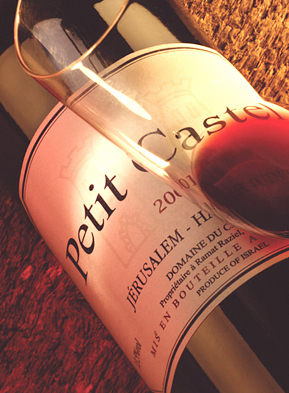 Soon after, Eytan walked into the room with a bottle of the newly minted 2009 Petit Castel! 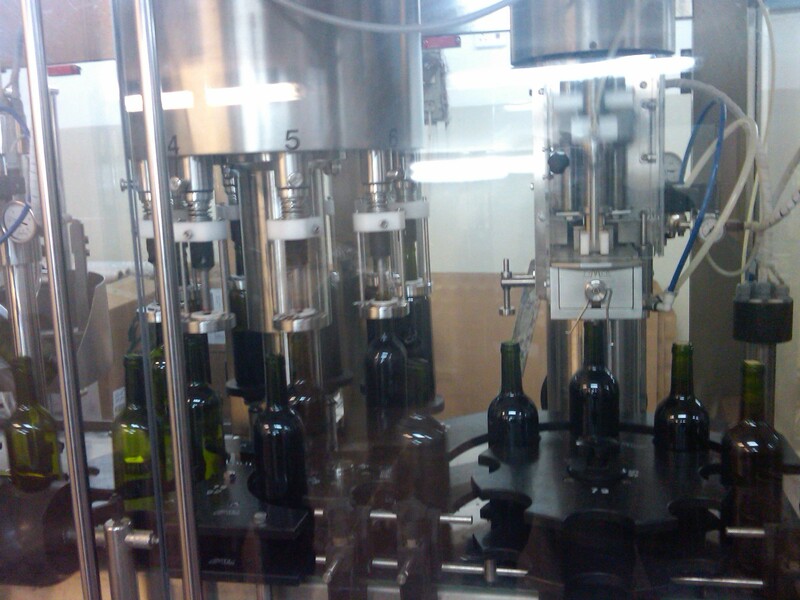 What a treat, we were the QA (Quality Assurance) for the winery, for that day! Of course, the wine was super young and just bottled, but it was a lovely wine and well worthy of the Castel name. 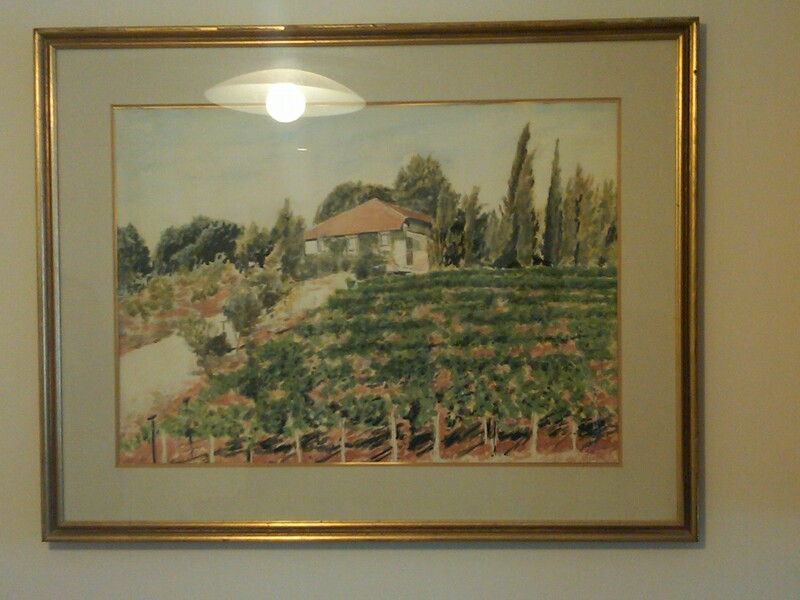 As we were walking out we turned to see two paintings on the wall; the first being a painting of the vineyard and house of old, the second one being a painting of the man himself, Mr. Ben Zaken, standing in front of his, a fore mentioned, original vineyard and home. These are fitting pictures to the God Father of the Judean Hills. A man who through the passion of family and agriculture, single handily put the original and still massive star on the Judean Hills wine region. A man, who with his family, continues to drive the family run winery forward from strength to strength! The nose on this garnet colored wine (from a newly bottled bottle) is rich with chocolate, oak, blackberry, mint or eucalyptus, ripe plum, and currant. The mouth on this semi mouth coating wine is rich with blackberry, raspberry, currant, ripe plum, oak, chocolate, and nice soft tannin. The mid palate flows off the mouth with more nice tannin, chocolate, ripe plum, and oak. The finish is long and spicy with more chocolate, tobacco, mint, eucalyptus, raspberry, blackberry, and a hint of leather. Posted on November 17, 2011, in Food and drink, Kosher Red Wine, Kosher White Wine, Wine, Wine Tasting, Winery Visit and tagged Domaine du Castel, Wine Tasting at Winery. Bookmark the permalink. 27 Comments.